M. Night Shyamalan’s 1999 film The Sixth Sense was The Usual Suspects of the supernatural genre – rightly considered one of the most twisty, spooky, moody and ultimately satisfying thrillers of modern cinema and one that, two decades later, stands up to repeat viewing and ever-deeper scrutiny. 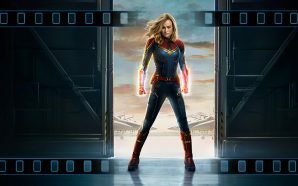 It’s a big-screen benchmark of success that others – and the director himself – have tried to emulate. Unbreakable (2000) was the first film to come after The Sixth Sense and was an interesting, furrowed-brow take on the idea of superheroes – no jumping tall buildings in a single bound but more a pondering on what a person might do and feel if they thought they had abilities that set them apart. Bruce Willis works with Shyamalan again, this time as David Dunn, who seems to survive whatever is (literally) thrown at him and who meets the wheelchair-bound Elijah Price (Samuel L. Jackson) who has his own ideas to offer on why some people are born differently. It’s a smart, off-beat and quite insightful look at comic-book mythological concepts rather than being completely successful or consistently entertaining, but as a left-field offering it’s often under-appreciated and at least suggested Shyamalan might have more to say than being a one-hit wonder. His subsequent follow ups seemed to becalm that momentum or reverse course entirely. Signs (2002), The Village (2004) and The Lady in the Water (2006) all boasted big name casts and great expectations. However they were often stories that seemed more concern with last-minute surprise pivots than workable internal logic… and suffered somewhat diminishing returns. Their success or failure seemed to rest on interesting one-sentence pitches, ‘Aha!’ moments and suspensions of disbelief that often failed to make internal sense or satisfy in the long term. Your mileage may vary, but general reviews ranged from mixed to incredulous and later efforts such as The Happening (2008), The Last Airbender (2010) and After Earth (2013) were largely – and rightly – savaged as the thinly-scripted, half-realised and deeply flawed outings they were. 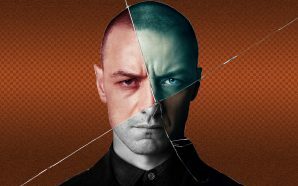 In 2016, Shyamalan released Split – which seemed to see him veer away from Hitchcock-worship and into unapologetic De Palma-territory with the story of a man, ‘Kevin’ (James McAvoy) with multiple personalities who kidnaps three young girls and the subsequent power-plays between them all. Within its own niche – not so much slasher as bloody, psychological horror – it was effectively done. McAvoy took every opportunity to mercilessly chew the scenery with an assortments of twitches, accents, affectations and body language quirks within the same ‘body’. It was likely an actor’s dream-job (though probably a nightmare for anyone wanting Hollywood to do anything other than continue to demonise and sensationalise real multiple-personality disorders). Anya Taylor-Joy as captive Casey Cooke also proved impressive. For what it was, it was fine. But Shyamalan can’t resist closing out with that ‘Gotcha!‘ and an additional tag/end scene at the end of the film – spoilers! 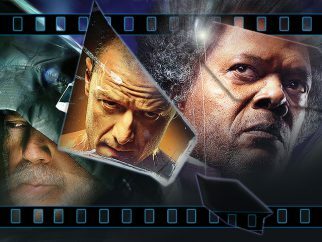 – revealed that the story we’d watched happened in the same universe as Unbreakable, with Willis/Dunn making an appearance and so obviously setting up a film that brought in the elements from the two films. Which brings us to…. ‘Glass‘. It’s over fifteen years after the events of Unbreakable and a short time after Split and David Dunn continues to informally patrol Philadelphia, using his superior strength and his visions to try and avert tragedy and crime and ably assisted and overseen by his tech-savvy son Joesph (once again played by Spencer Treat Clark). He’s become something of an urban legend. Dunn is aware of the kidnapper known as ‘The Beast’ (aka McAvoy’s amalgamated personalities) still being at large and a chance encounter with ‘Kevin’ in the city’s factory district leads to a face-off – but one that ends badly for both. A psychiatrist, Ellie Staple (Sarah Paulson) independently manages to wrangle Kevin, David and the already incarcerated Elijah, wanting to study what she claims are their ‘delusions’ and slowly providing them with alternative reasons for their abilities, related to the way they’ve perceived and channeled their traumas. While David’s son, Elijah’s mother and even Casey Cooke relate their experiences and encounters that would seem to prove the existence of the super-human, Dr. Staple succeeds in apparently planting the seeds of doubts in all her patients’ minds. But who is playing who… and what are the wider consequences if some people start to believe in the ability to be greater than others? 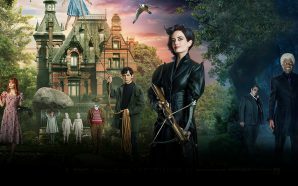 As with almost every M. Night Shyamalan movie it’s not that there isn’t an interesting question or concept at the film’s heart – there’s always a hook that draws you in and promises you a mixture of twists, turns, home truths and homespun fables. It’s just, yet again, the subsequent delivery system falters under its own weight. Night is once again the multi-tasking director/writer who is handling everything except impartial quality control, apparently the sole barometer of judging his own work. (I met him during his promotion for The Lady in the Water and asked him if he’d ever consider writing something for someone else to direct or directing someone else’s script and he seemed genuinely bewildered at the mere prospect, it would dilute his vision). And sadly, it is that choice and that ego that hobbles much of what has some potential. Most directors ruthlessly adhere to the ‘kill your babies‘ demands of culling their personally favourite scenes from a production if they can be convinced it will legitimately help the over-all story. On the other hand Night metaphorically adopts every one he can find and puts them through college – feeling like someone who believes that every frame and original decision was valuable and refuse to snip any surplus away. The results are all too often bloated films that would make entirely decent – even superior – episodes of, say, The Twilight Zone if reduced down to their core gimmick or twist but are stretched out beyond their natural form like a joke overstaying its punchline or a mediocre trick overshadowed by its prestige. Glass meanders along with an innate sense of profound self-importance but fatally delivered with no real sense of urgency. The questions it asks about the power of belief and mythological counter-balancing are fine in and of themselves – and perhaps welcome in an age where there’s a massive amount of superheroes otherwise defined more by crisp but shallow CGI than anything deeper – but they are essentially exactly the same questions asked in Unbreakable but spread out even more thinly across a bigger canvas. It’s telling that the all-name casting can’t save it. Jackson remains a draw (“Who will avenge us?” he shamelessly slurs in one scene in what is tempting to think is a larger cry for help), McAvoy certainly has range and Paulson likes to pick interesting supporting roles, but sadly the days of a Willis credit dictating something between genuine quality and at least passable fun are long gone. All the performers look earnestly into frame (including the now distracting tradition of Shyamalan giving himself a self-serving speaking role) but no-one’s really trying too hard. In the end, it promises a high-scale battle upon a skyscraper but quite literally, never makes it out of the hospital car-park. Some metaphors write themselves. 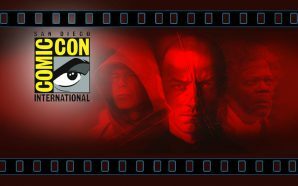 SDCC: Will Shyamalan’s ‘Glass’ save or shatter?